Christmas is approaching fast, so while there’s still a little time I want to share a couple last minute simple stamped Holidays card that I made using products from Hero Arts. 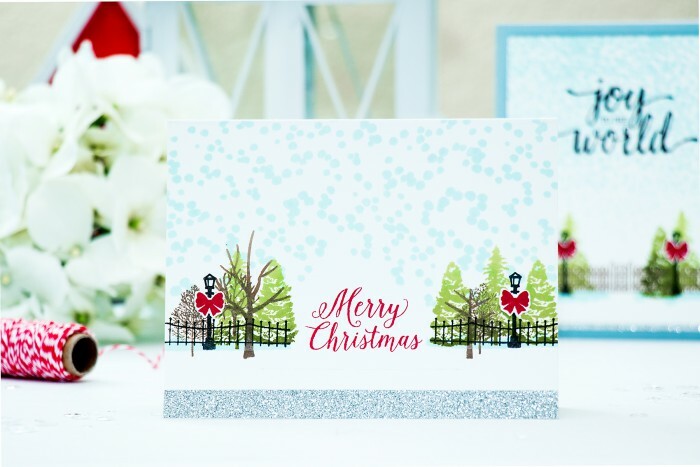 First up is this Joy To The World Card created using a couple different stamp sets. I’ve been wanting to play with Hero Art’s 3-D House Essential stamp set and use it not just to dress up the matching die cut (there’s a fun little house die cut that use you decorate using that set, I’ll link to it below). Since this particular stamp set features lots of scenery-type objects I decided to use it to stamp little winter scenes. I started with the fence and stamped it along with the fence gate using Cup Of Joe Brown ink. It was a bit difficult to align the fence perfectly so I stamped lamp posts in black to cover any imperfections. Since I was making a holiday card I also added several trees stamped in Lime to Forever Green ombre ink pad from the Winter Scene stamp set. I also added a beautiful red bow stamped in Red Royal onto each of my lamp posts (I used a tiny bow stamp from the Happy Merry Messages set by Lia). 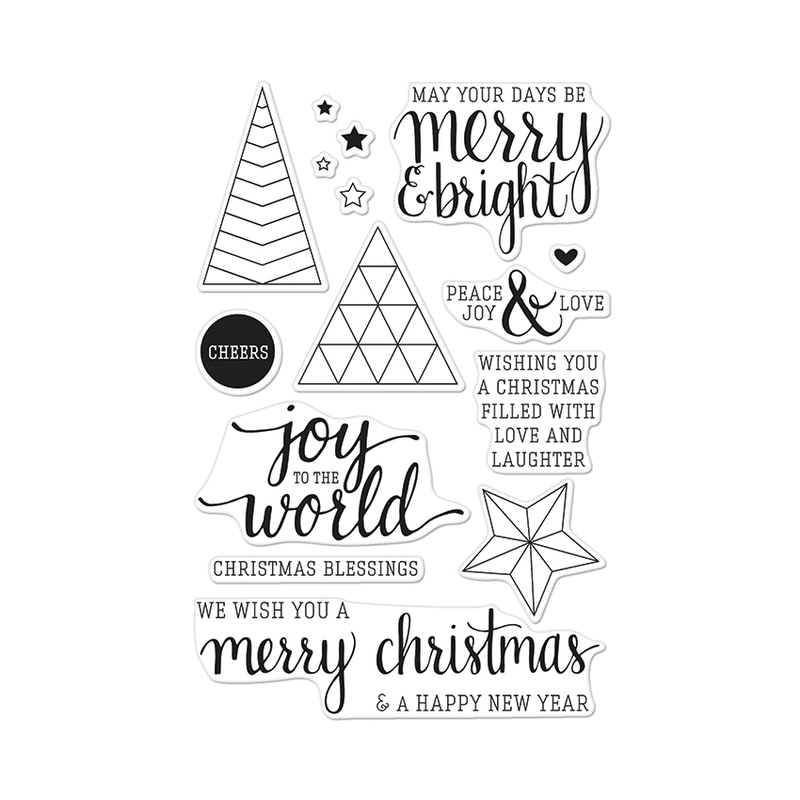 The sentiment came from the beautiful Joy To The World stamp set and was stamped in black. I also added quite a lot of snow using Snow stamp from the Winter Scene stamp set and Soft Pool ink. 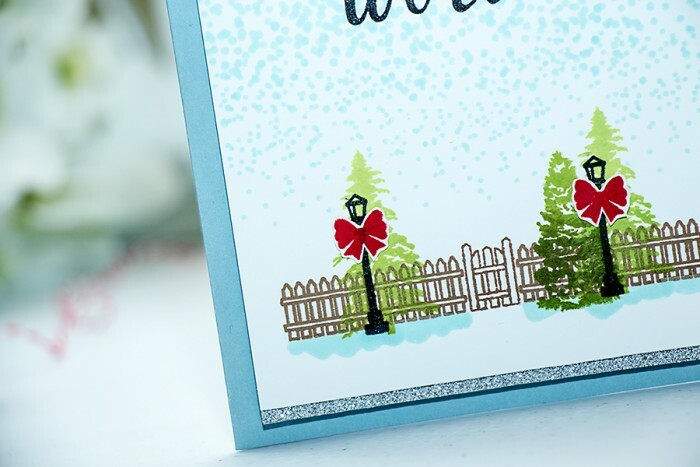 My stamped panel was decorated with a strip of silver glitter tape and foam mounted onto a light blue card base from Hero Arts. My second project, Merry Christmas was created in a similar way. I used another fence image (also from the Hero Art’s 3-D House Essential stamp set) and stamped it in black ink. Added identical lamp posts and bows and stamped a few more trees – from both Winter Scene and 3-D House Essential sets. Snow came from another stamp set, you can see the dots are much larger; I used Color Layering Fall Tree image and stamped it in Soft Pool. 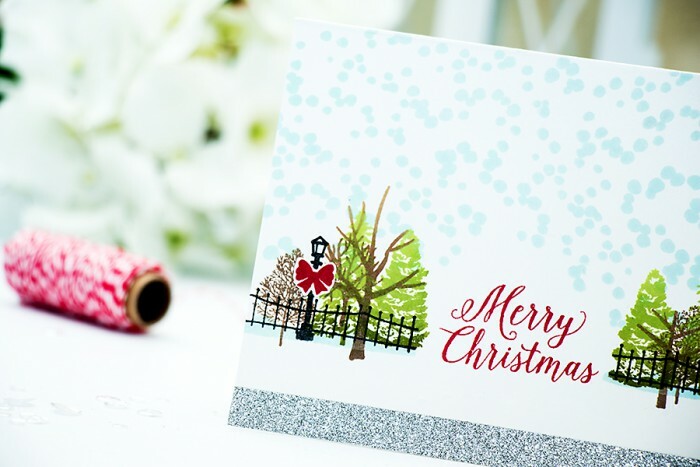 The Merry Christmas sentiment was stamped in Royal Red and came from the Happy Merry Messages set by Lia. This card, inlike the first one is a one layer project (aside from the red bows, which I had to fussy cut and adhere onto the lamp posts). I first intended to have a little house stamped where the sentiment is, but ended up not doing that. Beautiful combination of stamps, love it!